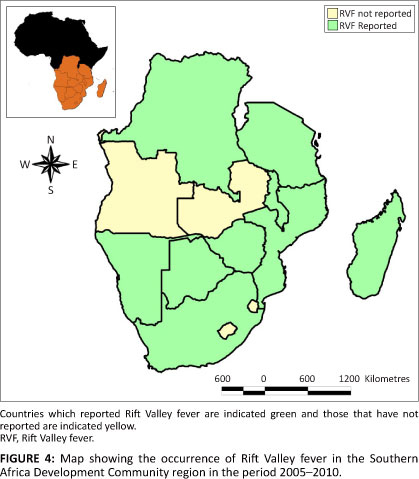 Rift Valley fever (RVF) in Zambia was first reported in 1974 during an epizootic of cattle and sheep that occurred in parts of Central, Southern and Copperbelt Provinces. In 1990, the disease was documented in nine districts of the provinces of Zambia. In the last two decades, there have been no reports of RVF. This long period without reported clinical disease raises questions as to whether RVF is a current or just a perceived threat. To address this question, World Organisation for Animal Health (OIE) disease occurrence data on RVF for the period 2005-2010 in the Southern Africa Development Community (SADC) was analysed. From the analysis, it was evident that most countries that share a common border with Zambia had reported at least one occurrence of the disease during the period under review. Due to the absence of natural physical barriers between Zambia and most of her neighbours, informal livestock trade and movements is a ubiquitous reality. Analysis of the rainfall patterns also showed that Zambia received rains sufficient to support a mosquito population large enough for high risk of RVF transmission. The evidence of disease occurrence in nearby countries coupled with animal movement, and environmental risk suggests that RVF is a serious threat to Zambia. In conclusion, the current occurrence of RVF in Zambia is unclear, but there are sufficient indications that the magnitude of the circulating infection is such that capacity building in disease surveillance and courses on recognition of the disease for field staff is recommended. Given the zoonotic potential of RVF, these measures are also a prerequisite for accurate assessment of the disease burden in humans. Rift Valley fever (RVF) is an economically important, emerging arthropod-borne viral disease of both livestock and man. The disease was first identified in 1931 following sudden death of lambs and ewes on a single farm along the shores of Lake Naivasha in the greater Rift Valley of Kenya (Daubney et al. 1931, reviewed in Pepin et al. 2010). The importance of the disease lies in its public health impact and the economic losses resulting from the cessation of trade in livestock and livestock related products. This has been shown by the prolonged import bans from countries in the Horn of Africa where RVF has been registered, causing great hardship to the livestock trade based communities. In Zambia, RVF was first reported in 1974 during an epizootic of cattle and sheep that occurred in Chisamba (Central Province) and Mazabuka (Southern Province) districts and some parts of Copperbelt Province (Hussuein et al. 1987). Human death due to RVF disease in Chisamba was also previously reported (Watts et al. 1984). Several other epizootics have been reported in the same areas (Department of Veterinary and Tsetse Control Services annual reports 1975-1989). For a long time the disease was known to be confined to the same outbreak areas. However, a sero-epidemiological study carried out between January 1990 and March 1991 showed that the disease could have a country wide distribution (Samui et al. 1997). Although RVF is considered endemic in Zambia, the clinical disease has not been reported in the last two decades. This long period without reported cases raises questions as to whether RVF is a current, or just a perceived threat. This article reviews some of the reasons as to why RVF has not been reported in Zambia in the recent past through focusing on the aetiology, epidemiology and risk factors associated with the disease. Furthermore, the OIE disease occurrence data on RVF for the period 2005-2010 in the Southern Africa Development Community (SADC) will be analysed. Rift Valley fever is an arthropod-borne viral disease caused by a Rift Valley fever virus (RVFV) of the family Bunyaviridae and genus Phlebovirus. The RVFV genome is made up of three segments namely L, M and S which are packaged together in the virions in the form of ribonucleoprotein (RNP). The L and M segments present in the virus particle are of negative polarity. The L segment encodes a single protein which is the viral RNA-dependent RNA polymerase (Muller et al. 1994; Pepin et al. 2010), and for the precursor to the glycoproteins. The M segment encodes four proteins, NSm1, NSm2 and two glycoproteins, Gc and Gn (Collett et al. 1985; Collett et al. 1986; Schmaljohn & Hooper 2001). The S segment utilises an ambisense strategy to code for two proteins, the nucleoprotein N, in the negative polarity, and a non-structural protein, NSs, in the positive polarity (Giorgi et al. 1991). The virus is resistant to heat and could stay active for four months at 21 °C and 3 hours at 56 °C (Flick et al. 2005). However, it can be inactivated by strong calcium or sodium hypochlorite, especially when treated for three hours at 56 °C (Sossah 2009). There is only one serotype of RVFV known to date (Martin et al. 2008). In Zambia, there is no evidence regarding the physical isolation of RVF virus from the field. However, there is enough serological evidence to suggest the presence of the virus (Davies et al. 1992). Clinical manifestations of the disease in ruminant livestock, especially sheep and cattle, are characterised by high mortality (100% in neonatal animals and 10% - 20% amongst adult animals) and high abortion rates particularly in infected pregnant animals (Coetzer 1977, 1982; Swanepoel 1994). In humans the disease is self-limiting, although complications of hemorrhagic fever, retinitis, blindness, and encephalitis may occur in 1% - 2% of affected individuals with a case fatality of approximately 10% - 20% (Madani et al. 2003). Rift Valley fever disease is an important endemic problem in sub-Sahara Africa which includes Zambia. The disease outbreaks in Africa occur at irregular intervals of 5-15 years in the savannah grasslands and 25-35 years in the semi-arid regions. Rift Valley fever virus has demonstrated a real capacity to emerge in virgin areas as shown by the outbreaks in Egypt (1977, north of the Sahara desert), Madagascar (1979), Saudi Arabia and Yemen (2000), outside the continent of Africa (Centre for Disease Control and Prevention 2000; Morvan et al. 1992; Shoemaker et al. 2002). Rift Valley fever virus has two transmission cycles, namely the enzootic and epizootic cycles. Enzootic cycle occurs during periods of normal amounts of rainfall. In the enzootic cycle, RVF virus is maintained by low-level activity within the mosquito vector population involving transovarial transmission with occasional infection and amplification of virus in wildlife such as African buffaloes (Syncerus caffer) or susceptible livestock. Epizootic or epidemic cycles occur following extended periods of exceptionally plentiful rainfall and subsequent flooding of dambos, which results in the emergence of abundant numbers of floodwater Aedes mosquitoes. These transovarially infected mosquitoes feed on susceptible livestock (e.g. sheep and cattle) that rapidly develop high-titer viremias and signs of clinical disease. The infected livestock in turn infect secondary bridge mosquito vectors such as the Culex or Anopheles spp. (Coetzer 1977, 1982; Turell et al. 1984) and thereafter, human infections develop as a result of bites from infected mosquitoes (Aedes, Culex or Anopheles spp. ), exposure to infectious aerosols, handling of aborted fetal materials, or percutaneous injury during slaughtering or necropsy of viremic animals (Meegan 1981; Van Velden et al. 1977). It is unclear whether humans have any important biological role as amplification hosts in the RVF virus epizootic or epidemic life cycle. The past distribution of RVF outbreak in Zambia is well documented (Department of Veterinary and Tsetse Control Services annual reports, 1975-1989; Davies et al. 1992; Hussein et al. 1987; Samui et al. 1997). The high risk areas have been identified where several RFV epizootics had occurred. These areas include Ndola in the Copperbelt Province, Chisamba in the Central Province, and Lusaka and Mazabuka in Southern Province (Hussein et al. 1987). Rift Valley fever clinical signs were limited to susceptible Bos taurus cattle and imported sheep. However, a RVF sero-epidemiological study carried out in 5 traditionally managed herds that graze in the Kafue flats (flood plain grasslands [Figure 1]) showed that RVF was not only a threat to the commercial exotic breeds but also to the indigenous local breeds. For instance, a study carried out by Ghirotti et al. (1991) in the Kafue flats showed that 14% of the indigenous cattle tested seroconverted to RVF. The 14% RVF sero-prevalence rate was attributed to high concentration of wild and domestic ruminants grazing together in the flood plains during the dry season. It is worthwhile to mention here that no studies have been done to determine the role of wildlife in the maintenance of RVFV in Zambia. Furthermore, the sero-epidemiological study carried out between January 1990 and March 1991 in at least one district of each of the nine provinces showed the existence of RVF in the respective districts studied (Samui et al. 1997). The high positive rates were also observed in areas where cattle grazed in dambos or flood plains (Table 1 and Figure 2). The results of this study suggest that RVF was not only endemic in the commercial farms of Chisamba, Lusaka and Mazabuka but could be endemic throughout most of the cattle producing parts of the country. The implication of these results are that the traditional farmers who graze their cattle in the flood plains or dambos together with all those involved in livestock production are particularly at risk of contracting RVF if it is still circulating at high prevalence in cattle, sheep and goats, and if the local environment is favourable for transmission of the virus. In Zambia the disease has not been reported for the last two decades. This period without detected disease does not necessary mean that RVF is not a threat to Zambia. This is so because from past RVF research, a low level of RVF virus transmission has been detected in livestock and humans during inter-epizootic periods (IEP). For example, a study carried out in animals born before the 1997-1998 and after the 2006-2007 outbreaks in Kenya showed a low IgG prevalence against RVF, indicating that virus transmission continued in Kenya during an IEP (Rostal et al. 2010). Similarly another study carried out in Senegal during an IEP in sheep and goats indicated a 2.9% seroprevalence (Chevalier et al. 2003). In Zambia, a study carried out during 1982-1986 on a sentinel herd using indigenous breeds at Lutale in Mumbwa showed a low level of seasonal RVF virus activity of 3% - 8% (Davies et al. 1992). The studies carried out in Zambia and other parts of Africa clearly support the existence of low degree of RVFV transmission during the IEP and that this low level of seasonal virus activity could generate epizootics as witnessed by the 1985-1986 epizootics in Zambia (Hussein et al. 1987). More interestingly, evidence of interepidemic human transmission of RVFV has been reported. In Kenya, research done on children born after the documented RVF outbreak of 1997-1998 showed that low-level interepidemic transmission to humans continued to occur (LaBeaud et al. 2008). Although there are no studies done on interepidemic human transmission of RVFV in Zambia, the results of the previous studies done in animals and humans during IEP clearly shows that RVF is a serious threat to Zambia. Although a low level virus activity has been demonstrated during IEP in studies carried out in Kenya and Zambia (Davies et al. 1992; Rostal et al. 2010), no RVF associated abortion or death was observed. This implies that the infected livestock developed no clinical signs or developed mild febrile illness with no obvious clinical disease. The lack of specific RVF signs during IEP implies that the presence of RVF could only be detected through specific, well-focused, active surveillance. Therefore countries like Zambia with limited resources to carry out this type of surveillance during IEP could have problems in detecting the threat of RVF early and subsequently fail to report the disease. Analysis of the OIE disease occurrence data on RVF for the period 2005-2010 in the SADC region showed that most countries that share a common border with Zambia had reported at least one occurrence of the disease during the period under review. Since conditions which predispose to RVF activities tend to occur on a regional level (Davies et al. 1992), the failure to detect the disease could be linked to the weak national surveillance system. Inability of the field veterinary staff to recognise the clinical, pathological and epidemiological features of the disease is yet another challenge as far as reporting of RVF occurrence is concerned. For example, when confronted with a disease that involves abortion during IEP, RVF is not included on the list of differential diagnosis. It is worthwhile to mention here that in Zimbabwe, RVF-associated abortions were found in cattle over a period of 7 inter-epizootic years (1971-1977) and the temporal pattern suggested a possible annual emergence of infected mosquitoes (Swanepoel 1981). This report shows clearly why it important to include RVF in the list of differential diagnosis especially when specimens are collected from cattle that have aborted. However, the diagnosis of RVF during IEP is further undermined by a shortage of RVF reagents which comes as a result of lack of planning or funding. It is worth mentioning here that during IEP, awareness and preparedness tend to decrease drastically as limited resources required for surveillance activities are redirected to other areas. There are several factors associated with the occurrence of RVF. These includes climatic conditions (rainfall, temperature, cloud cover), geographical features (dambos, flood plains), vegetation cover, livestock trade (both local and international) and human activities (such as building of dams, irrigation schemes). Rainfall is one of the determinants of RFV outbreaks and this has been analysed in relation to the RVF epizootics in Kenya (Anyamba et al. 2009, 2010; Davies et al. 1985; Richards et al. 2010). 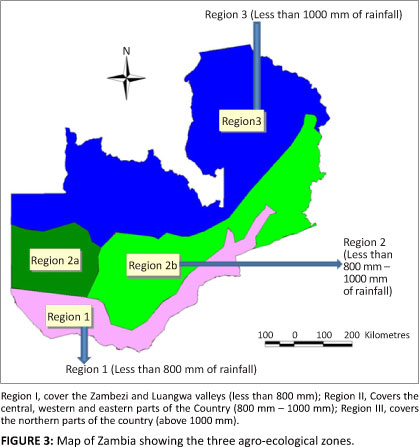 Zambia receives a good amount of rainfall annually and the rainfall pattern is divided into three agro-ecological zones namely region I, II and III (Figure 3). Region I, the driest, is most prone to drought and receives less than 800 mm of rain annually. This region includes the Zambezi and Luangwa valleys. Region II covers the central part of Zambia extending from the east through to the west. It receives rainfall of between 800 mm and 1000 mm. Region III covers the northern part of the country and receives more than 1000 mm of rainfall in a season. Region II and III are more prone to flooding and have high incidences of malaria due to high vector activities. Therefore, the amount of rain tend to increase towards the north and decrease towards the south. The rainfall is considered to influence the onset of disease by producing a rising water table, to the point where seasonal flooding occurs, particularly in certain geomorphic formations known as 'dambos'. Vegetation changes, due to a change in climatic conditions, has an effect on mosquito habitats. For instance, in the rainy season the proliferation of vegetation and increase in vegetation biomass favours the increase in population of mosquito species that are capable of transmitting diseases to livestock and humans. The dry season does not favour vegetation proliferation and hence there are fewer mosquito-borne diseases. In Zambia, a sentinel herd study was carried out in 1982-1986 to determine whether annual RVF virus activity occurred and was associated with seasonal rains. The results showed that a low level RVF virus activity of 3% - 8% did occur in each of the years. However, in 1985-1986, more than 20% of the animals seroconverted and this greater activity was associated with vegetation changes (Davies et al. 1992). The vegetation change was detected by remote sensing satellite imagery. Livestock trade has previously been associated with the introduction of RVF in news areas (Centre for Disease Control and Prevention 2000; Madani et al. 2003). There is a lot of livestock trade between Zambia and her neighbours, which means that the introduction and spread of new diseases from neighbouring countries is high. OIE disease occurrence data on RVF for the period 2005-2010 in the SADC region showed that most countries that share a common border with Zambia had reported at least one occurrence of the disease during the period under review (Figure 4 OIE, World Animal Health Information Database [WAHID] Interface). 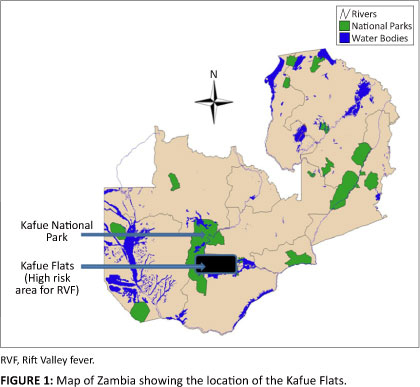 Due to the absence of natural physical barriers between Zambia and most of her neighbours and given that the conditions which predispose to RVF activity do occur on a regional level, there is a high probability that RVFV could be circulating in Zambia. This review demonstrates that RVFV is a threat to Zambia as the environmental risk factors conducive for its propagation are widely distributed in most livestock producing areas. Despite the threat posed by RVF in Zambia, little research has so far been done. Most studies documented so far were limited to the high risk areas and only conducted during RVF outbreaks. Little is known about RVF virus activities during IEP both in the high risk and low risk areas. Currently, there is no information regarding the different types of RVF virus strains found in Zambia. Nothing is known of their virulence, pathogenicity or distribution in the different ecological zones of the country. The current prevailing hypothesis is that RVF virus is maintained in the eggs of Aedes mosquitoes which are seasonal floodwater breeders (Davies et al. 1985). However, different Aedes spp. have been implicated in the transmission of RVFV in different regions of Africa. For example, Ae. ochraceus, Ae. vexans arabiensis and Ae. dalzieli are known vectors of RVFV in West Africa (Fontenille et al. 1998) where as Ae. mcintoshi/ circumluteolus are known vector of RVFV in East Africa (Huang 1985). In Zambia, the potential mosquito vector species that might be involved in the enzootic or epizootic cycles has never been documented. Baseline data regarding their distribution and ecology is missing. The role of these mosquitoes in the maintanance of RVFV is not well understood. Human infection through direct contact with aborted foetuses, meat and other animal byproducts during RVF outbreaks (LaBeaud et al. 2008), the specifics of what types of animal exposure are most risky, have not yet been elucidated. 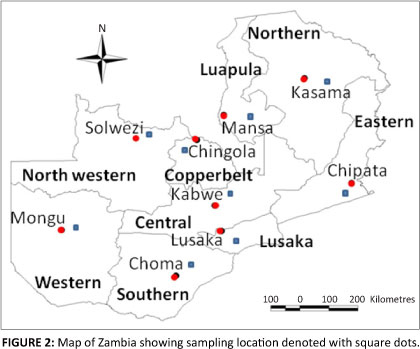 Although human death due RVF was reported in the endemic areas of Zambia (Watts et al. 1984), no studies have been done to determine whether RVF transmission to human occurs during IEP. Lastly, the current RVF early warning system needs to be improved by including spatial and population parameters so as to achieve higher precision and confidence. Therefore, in order to control RVF in the endemic and non-endemic areas of Zambia, future research should aim at addressing the above mentioned gaps. The data generated from such research will help veterinary, health policy makers, planners and other stakeholders in prioritising, designing and implementing cost effective and sustainable RVF control programs. This work has been supported by Wellcome Trust Grant WT087546MA to the Southern African Centre for Infectious Disease Surveillance (www.sacids.org) and its collaborating UK partner institutions, namely the London School of Hygiene and Tropical Medicine (http://www.lshtm.ac.uk), the Royal Veterinary College (http://www.rvc.ac.uk) and the London International Development Centre (http://www.lidc.org.uk).